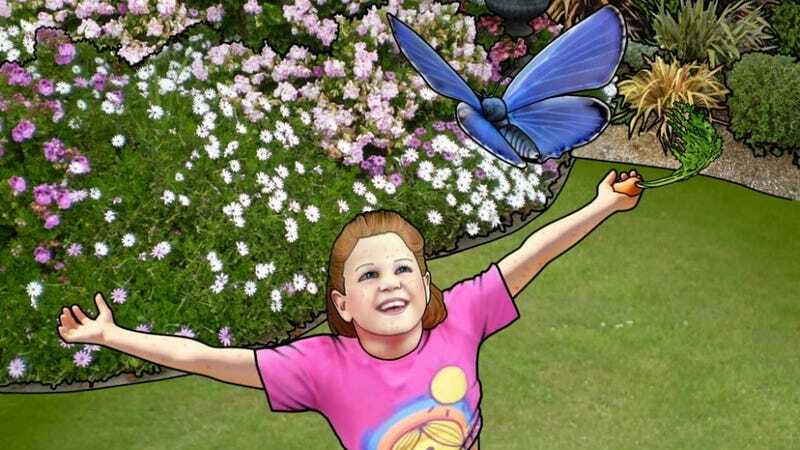 Melanie's Marvelous Measles is a book about how awesome it is to catch the measles. Children ages 4-10 are invited to learn that the measles is actually pretty fun, has no serious possible side-effects, and is something kids should look forward to getting. The book includes helpful medical advice, like that measles is easily avoided by drinking melon juice, and that vaccines weaken the human immune system, but getting measles strengthens it (as does melon juice). Image from the cover of Melanie's Marvelous Measles. Copyright Stephanie Messenger. Used without permission. Melanie, the titular character. She was vaccinated but got measles anyway, the "worst case" the doctor had ever seen. Which means she's smiling and energetic, having fun playing, and has some cool red dots she likes to show off. Melanie's mom, who's response to her daughter getting measles (in a classroom that apparently has a 50% vaccination rate) is "so much for vaccination!" Tina's older brother, who got sick after a routine vaccination and now has a "weak" immune system. Tina's mom, who "decided to find out more" after the brother got sick, and now goes around telling people that drinking melon juice is more effective at preventing measles than vaccination is. Okay, so the book is bad. Badly written, badly plotted, badly "drawn" (it appears to be a series of Photoshop filters and traced outlines applied to badly posed photos) and with an absolutely terrible message, one that nobody really stands to benefit from (except melon farmers?) and everybody stands to lose by. Who would even write such a thing? The author's self-described journey to anti-vaccination activism was substantially more tragic than most. It's heartbreaking, actually, a very sad and personal story involving the eventual death of her only child. I don't feel it's really my place to retell it here, but if you want to read it in her words the story is the entire main page of her website. It sounds like Stephanie Messenger had bad experiences with doctors and nurses during all this. We've all received a hurried or dismissive response from a doctor or nurse, but when your child is dying (and when they're ultimately unable to even diagnose your child with any real certainty) . . . that would be really hard. I am overwhelmingly sad for Stephanie Messenger's tragedy, and I am very, very glad that her three other children (born after these events took place) are apparently healthy and well. I understand, at least intellectually, how some bad incidents combined with that much fear and grief and helplessness might plant the seeds of distrust. But then there is her aunt. My dear aunt who worked in the paediatric ward at a major hospital told me outright that she has seen many babies in the wards who looked just like my baby and the thing they all had in common was they were just vaccinated. She went on to say it never goes on the charts as vaccine damage, but she discusses the timing with the parents to confirm this.
. . . holy dang. If there's one single villain in this story, I think it's the aunt. Sneaking around (I assume, I can't imagine she'd still be working there otherwise) and "confirming" her conspiracy theories with grief-stricken parents in her ward as they watch their children suffer and/or die . . . and twisting her niece's confused pain and tragedy into a lifelong mission ensuring that many other children have a chance to die young, too. But it wasn't just the aunt. It's easy to label the anti-vaccine crowd as "uninformed", or say that they just ignore the facts. But in a way, Stephanie Messenger is not uninformed, nor is she in any way lacking in facts. Instead, she's misinformed, and the facts to which she's most often exposed are misleading, half-truths, or just flat out untrue "facts". I have since gone on to read hundreds of books, some written by very courageous doctors who have bothered to investigate this issue thoroughly, read medical journals and also watched some DVD's done by doctors all to warn parents about the dangers of vaccination. For "anti-vaxxers," cognitive dissonance is compounded by the overwhelming amount of evidence and expertise undergirding the utility and safety of modern vaccines. Or . . . it would be, were the anti-vaxxers not buried in near-literal mountains of their own "evidence". There are thousands of anti-vaccination books on the market, including a handful by people with impressive credentials and a Ph.D. or M.D. after their name. And then there's the countless websites and blogs, with tens or even hundreds of thousands of articles, links, references, even citations of peer-reviewed research, all purporting to "prove" that vaccines don't work as advertised, or they're harmful, or something else, or all of the above. For someone predisposed to distrust "Big Pharma," or "unnatural chemicals," this unending supply of anti-vaccine reading material acts as a sort of vaccination itself, a vaccination against having to face the overwhelming evidence that you're very, very wrong. The Stephanie Messengers of the world really can read hundreds of books, and claim to have read peer-reviewed studies and journals, believe from the volume of their research that they have done good research, and in the end be so well-armed against reality that they never need fear the pain of cognitive dissonance ever again. And now Stephanie Messenger has crossed over; no longer simply the recipient of these "anti-information vaccinations," she's now creating her own contributions to the information-inoculation industry, offering anti-vaxxers a happy, kid-friendly face wrapped around strawmen and author-self-inserts trumpeting empty talking points and logical fallacies . . . badly written, but just good enough to offer a little more comfort to those who want to believe it.